This event is at capacity. If you have not already submitted an RSVP, we cannot accommodate you. Thank you. DuckDuckGo is the world’s leading pro-privacy search engine. Since its founding ten years ago, DuckDuckGo has processed over 26 billion search queries. The company has grown to over 55 employees and earned over $25 million in revenue. This conversation, between DuckDuckGo CEO Gabriel Weinberg and Professor Jonathan Mayer, will explore the privacy and business dimensions of building trust online. Topics will include the state of consumer confidence in the online ecosystem, growing an entrepreneurial venture grounded in user trust, and the future of trust online. 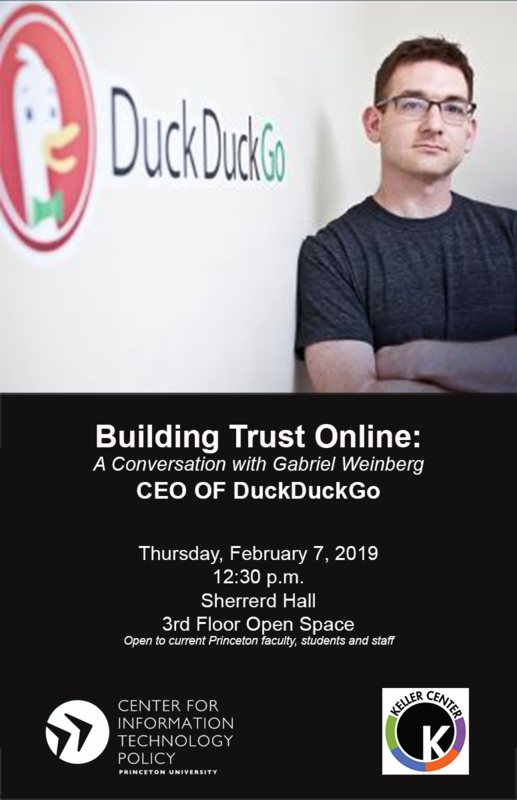 Since 2008, Gabriel Weinberg has grown DuckDuckGo from a self-funded operation out of his dusty basement into a business with over $25 million in revenue and 50 employees across multiple continents. Gabriel is a serial entrepreneur who previously founded other Internet-related companies; he is also an active angel investor. He co-authored Traction: How Any Startup Can Achieve Explosive Customer Growth (Penguin Portfolio, 2015) and co-wrote a forthcoming book on mental models, Super Thinking. Gabriel was also on General Electric’s four-member Digital Advisory Board for 2015. He holds a B.S. with honors from MIT in physics and an M.S. from the MIT Technology and Policy Program. Gabriel has been profiled in The Washington Post and Fast Company, and is routinely quoted in leading print publications such as The New York Times and the Wall Street Journal. Gabriel is also a frequent TV commentator, appearing on CNN, CNBC, and CBS This Morning, among others. He resides with his wife and kids in Valley Forge, PA and is on Twitter @yegg. This event is co-sponsored by the Keller Center.